Maureen O’Brien and was a part of the Arcturus Crime Classics collection. A collection of crime focused books by different authors. Close Up on Death is part of a bigger collection, however. Checking the website of the author, it would seem that there are 5 books that feature Inspector John Bright, we’ll come to him when I talk about the characters. Millie Hale finds a body in an empty house in Belsize Park, North London. It’s her best friend, Liza Drew, famous, beautiful TV star. A CID inspector turns up. He’s small, dark. dressed in a scruffy leather bomber jacket and looks more like a crook than a copper. He’s DI John Bright. The story hinges as much on the sizzling relationship between Bright and Millie as it does on who killed Liza Drew. Ooh exciting! What a plot. That is basically it: Mille Hale finds her best friend dead while meeting her at a house viewing. The story is told in first person from the point of view of Millie. It also chooses to concentrate solely on four people throughout the whole book: Mille, Paul, Liza’s mother Mrs Drew and Inspector Bright. I guess it’s a good time to talk about the characters then. Like I said, the book is told in first person from the point of view of Millie. It’s done for a reason and a very good one at that. Millie is also an actress and through the story it seems that she is the second fiddle to the talented Liza Drew. While you walk with her, you do find out a lot about her. She’s a very closed off person, she is a very good actress and she cares extremely for one other person, Liza’s boyfriend Paul, who was incidentally her boyfriend once upon a time. While reading, you do feel for her. She lost her best friend, she was second best to her friend, her friend’s mother hates her and she is trying to keep everything together for her best friend’s boyfriend who has his own demons he needs to deal with. Next then is Paul, a threatre actor and boyfriend of Liza Drew. He is caring, almost to the point of being completely clueless to what is happening around him. While he’s close to Millie and Liza’s mother Mrs Drew, he is very quick to withdraw himself from them too. In the book, you find out that he had an affair with a fellow actress and this makes him a suspect in Liza’s murder. Mrs Drew (Liza’s mother) is possibly the most bitter person in this whole book. You will end up hating her character for good reason. She seems to think that she is perfect and has something against Millie, almost to the point of hating her out right. Her story is revealed as you read on, and she is bitter for a reason, and its her own failing. She becomes a suspect because it is hinted that she is in love with Paul. Inspector John Bright comes off as the villain of this story. I’m not sure how the police in London behave, (not very well, since they are on the news a lot lately) but it seems as if Bright is really harsh to all of the characters throughout the whole. I spent most of the story hating him. I couldn’t really pinpoint what year “Close Up On Death” took place, but some of the references made me think it was around the late 1990s to early 2000s. After doing some research I found out that it was actually written in 1989, so I was kind of close. The overall story takes place in North-Northwest and West London, Suffolk and Sheffield. I found it very amusing when the character mentioned Willesden Green Lane and then, scowling, said it was less to be desired. 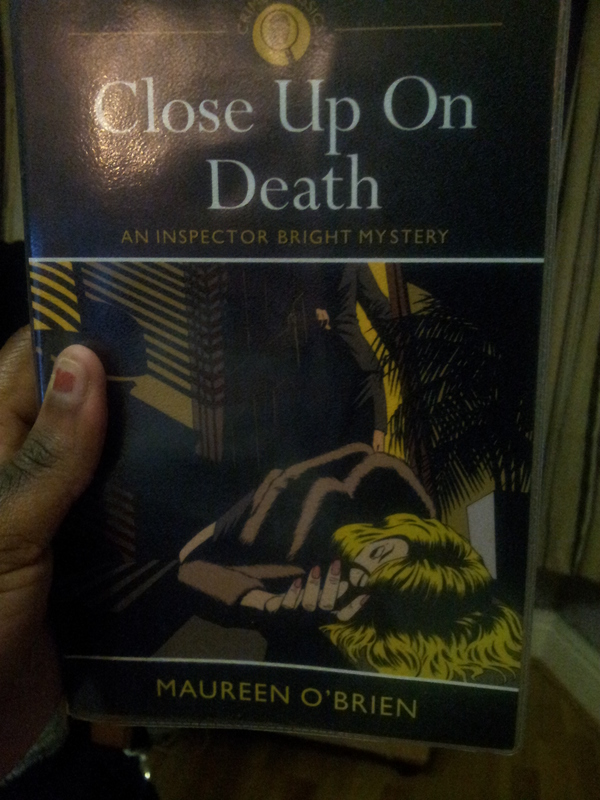 Overall “Close Up On Death” is a great read, if you are looking for a nice run-of-the-mill crime mystery with solid characters. The ending is one the makes you think as well as leaves a bad taste in your mouth.